Kleenex® VIVA® kitchen towels are suitable for all types of everyday cleaning tasks across a variety of workplaces; including the office, kitchen, school canteen and more. With a luxury feel and superior softness, these high-quality kitchen towels provide a premium experience for the user. Each towel is manufactured using Airflex technology, ensuring high absorbency and an efficient hand drying performance with every use. These cleaning towels maintain their superior strength whether used wet or dry. The multi-use cleaning towel is designed using new tough wave texture, creating a tough and durable hand towel. Available in twin packs for convenience, these kitchen towels fit most standard kitchen towel dispensers. Made in Australia using a sustainable mix of recycled and FSC virgin fibre, Kleenex® Viva Kitchen Towels are an environmentally friendly addition to your washroom. 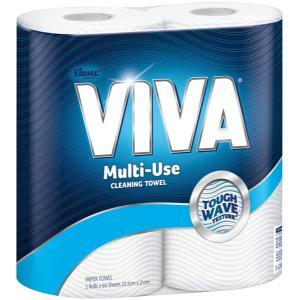 Kleenex® Viva kitchen towels, by Kimberly-Clark Professional*, form part of a wider range of cleaning products designed to create a safer, healthier and more productive workplace.